Mt. Oyama 大山 is a sacred mountain whose close proximity to Tokyo and Yohohama means it’s always a major drawcard for mountain climbing as well as religious pilgrimage. This time last year I had the opportunity to traverse across Mt. Tanazwa so with excellent spring weather on the horizon it was time again to head out to Kanagawa and climb another famous mountain. If you’re coming from Shinjuku the easiest option is to take an Odakyu Odawara express train to Isehara Station 伊勢原駅 (60 mins, 590 yen). Turn right at the ticket barrier and look for the number 4 bus stop. Buses heading to the Oyama Cable Car bus stop 大山 ケーブルカー depart every 20 minutes (25 mins, 310 yen) though be prepared for a fairly hefty line of fellow hikers even on weekdays. The best advice is to take a bus around 08:00am which should coincide with the first cable ride of the morning when services begin at 09:00am. From the Cable Car bus stop nosey on through the throng of souvenir shops and restaurants known as the Koma Sando taking a leisurely 15 minutes to reach the Oyama Cable Car. The Cable Car departs every 20 minutes (690 yen one way) and quickly whisks you up 400 metres to the Oyama Afuri Jinja 大山阿夫利神社. Alternatively, time and stamina permitting you can hike up on the men’s or women’s trail which takes around 35 minutes. The Oyama Afuri Jinja founded in 755 is actually comprised of two separate shrines with the main one (through smaller) positioned on the actual Mt. Oyama summit. From here the hike to the summit follows a clockwise direction (at the time of writing the trail to Mirashidai 見晴台 is closed). From the lower shrine the hike to the summit of Mt. Oyama (1,252 m) takes around 90 minutes. The trail is well trodden through at times fairly rocky and includes a couple of excellent viewing points. The previous day’s stormy weather had given way to magnificent clear skies with Mt. Fuji looking inordinately stunning. If the weather is fine, take plenty of snaps on the way up as sadly from the summit the westerly view is concealed by trees. On the summit there are plenty of benches and picnic tables to kick back on though based on the huge numbers of hikers I passed on the way back down it could get somewhat congested. After a lunch break and taking in some stunning scenery out towards Yokohama and even Oshima Island on a clear day the usual route is to head down to Mirashidai passing by the Niju waterfall 二重の滝. Unfortunately, as the trail from Mirashidai to the cable car had caved in the only option was to retrace back down again. From the Afuri Jinja station I decided to forgo the ride and hike the women’s trail stopping by the Oyama Temple 大山寺 and taking in the splendid spring flowers coming into bloom. Thankfully it also meant I was able to have some respite from the crowds before the long trip back. 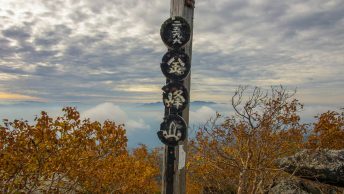 Is it possible to do the Mt Oyama hike in early December? Hi Jeff, indeed Mt. Oyama can be can be climbed year round, though carrying a pair of light crampons from Jan through March is recommended. As for early Dec you will be fine with regular hiking shoes. Thank you for the reply concerning Mt Oyama. Thank you for the guide, it really helped and made getting the train and bus much easier. I went during the new year holdidays, so it was super busy with everyone going to the shrine, but I got great weather on the day and was able to see Mt. Fuji clearly. Since this guide is a few years old the prices have changed slightly, the train from Shinjuku (Odakyu line) is still 590yen, however, the bus ticket is now 310yen while the ropeway is 690yen (one-way) or 1100 yen (round trip) up to Afuri Jinja. Thanks for that Jonathan and glad to hear the trail notes helped. I guess that 50 percent increase in cable car price is to offset the cost of those spanking new cars.